This entry was posted in 'Proof' of God, Atheism, Christian failure, Christianity's failure to deliver, evidence, faith, The Bible's unreliability, The impossibility of faith and tagged Bible, Christ, Christianity, Christians, evidence, God, Heaven, Jesus, Morality, Paul, Resurrection, Salvation, Supernatural beings, the Bible by Neil. Bookmark the permalink. Faith is the belief in something that cannot be proven. Therefore, atheism, the belief that everything just happened all by itself is 100% faith-based. The existence of God, however, can be proven through simple reasoning and has also been proven by the discoveries of modern science. Oh my God, you’re right! No-one knows how ‘everything happened’ so that must mean it was your favourite imaginary being! The Creator is the First Cause of everything. That you the atheist, scoff at logic is completely natural. The 100% faith-based creeds like atheism must necessarily scoff at logic. What logic is that then? The ‘logic’ that makes its conclusion its premise (‘the Creator is the First Cause’)? The ‘logic’ that presupposes there was a first cause? Many scientist postulate not, that the universe has always existed in some form or other. The ‘logic’ that insists a supremely intelligent being must always have existed while the universe, which we know for certain does, hasn’t? You exchange the empirically demonstrable for a hypothetical and unsupported supposition. The ‘logic’ that overlooks the point that a God cannot have been the First Cause. If he existed before the creation of the universe as you insist, then where did he(?) come from? Was there a Cause – the one that made him – before the First Cause? And if there was, what caused that cause? Unless this God made himself (from what? Nothing?) then you, and he, are caught in an infinite regression with this claim. The ‘logic’ that proposes that the ‘First Cause Creator’ is the petulant tyrant of the Bible, preoccupied with punishment, blood sacrifice and foreskins? The assumption that the ‘First Cause’ is this pantomime villain is not logical at all but a massive, insupportable leap of faith. I could go on, but why bother. You are more interested in ad hominem attacks on atheists than in logic. I don’t, as you accuse me, disparage or scoff at logic at all, but rather your much flaunted inability to apply it. A logical conclusion is not a presupposition. Again you show that you have no idea what logic is. And that is what allows you to be a 100% faith based atheist. That’s the way to do it; ignore everyone else’s points and re-post an unsupported (and insupportable) assertion from weeks ago. If this is the best you’ve got to offer, don’t bother commenting any more. If you do, and your comments are like this one, they won’t be appearing here. Up your game or stick to your own blog where your supporters don’t seem to care what you write. 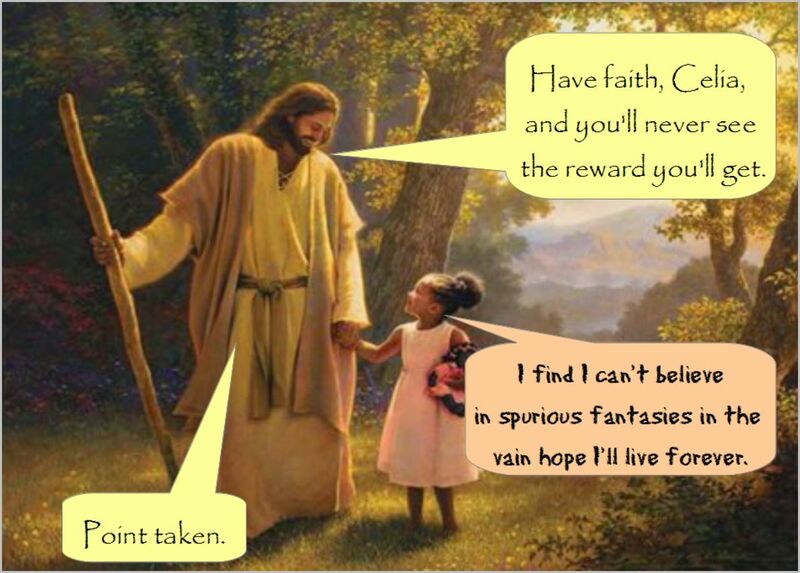 If the Judeo-Christian God is real, why would I want to put faith in him? He’s borderline with his emotion and reason. He talks about justice and love but has no qualms punishing people for eternity? Many may claim he is benevolent but yet in the Bible that many of his followers believe to be his word, he strikes them down with torture or death for some of the slightest things. Westernized nations balk at the idea of following ruthless, borderline dictator. Yet God’s followers proselytize that we have to follow him or else! That’s tyranny and I’m not standing for that!